At SPSG, our girls think for themselves and fully express themselve in a carefully crafted single gender/co-ed environment. It provides the focus, freedom, and competition they need. Single-gender schools have a singular ability to help students focus and express themselves freely. At St. Paul’s School for Girls, our middle and upper school classes are single gender when it matters most. The classroom dynamic this creates allows our girls to exercise their natural leadership skills unrestrained in an environment of social and intellectual freedom. Our girls value ideas. They think big. They move on to colleges and universities incredibly confident. Though we are single gender, we encourage co-ed opportunities at the right times to provide an important balance. On our campus, shared with St. Paul’s School, our middle schoolers partner with their male peers on community service projects and in stage productions, and dine together in the Ward Center. The same is true for our upper schoolers, but with the option of integrating with St Paul’s students in a range of courses from math and science to world languages and arts. At SPSG, our girls think for themselves and fully express themselves in a carefully crafted single gender/co-ed environment. It provides the focus, freedom, and competition they need. In 1976, three SPSG senior students walked up the hill to St. Paul’s School and entered the Advanced Placement Biology class. This initiative set in motion a program of coordination between SPSG and SP. Since then, coordination has grown and changed as faculty and staff of both schools have worked to enhance cooperation to provide the best possible program for both girls and boys, a program that allows students to have the “best of both worlds,” single-gender education with coed opportunities. Students benefit from coordination both academically and socially. The SPSG/SP system of coordination is complex but successful. Each school has its own Board of Trustees, Head of School, administrators, faculty, staff, and, of course, students. Each school has its own mission, sets its own priorities, and handles its own fundraising, admission, and faculty hiring. In the Upper School, students from SPSG and SP share a variety of elective courses and world language courses in French, German, and Japanese. They participate in joint art classes, including all stage productions. Community service projects and special events, such as the celebration of the work of The Rev. Martin Luther King, Jr. and Spirit Week, are also often shared. In Middle School, students do not participate in academic coordination, but often see their friends from SP at lunch in The Ward Center and at occasional social events like middle-school mixers. Girls and boys sometimes work together on special projects, such as community service activities. Middle schoolers from both schools also perform in joint concerts and in the annual middle school theatre production. In addition, coordination facilitates logistics for families with children at both schools. SPSG and SP share a common calendar, one that is constantly being updated by a team of people from both schools. Holidays are the same, as are snow days. Named one of the best child-care centers in Baltimore for infants (as early as six weeks), toddlers, and preschoolers (up to age 5). We provide a program that promotes the development of the whole child in the areas of social, emotional, physical, and intellectual growth. At the heart of our program is the knowledge that children need to feel safe and loved in order to reach out to the world. Our teachers identify and fulfill individual needs so that each child reaches his or her potential. Through literature and a variety of art, music, dramatic play, science, math, and reading readiness activities, children are challenged to learn and are inspired to love learning. Girls and boys are encouraged to share traditions and learn about different cultures as they explore the diversity of the world around them. A child’s innate growth process, teacher guidance, and parental support combine to form a team effort that ensures a supportive approach to early childhood experiences. Striking a balance between fine and gross motor skills, the program challenges girls and boys to master skills such as coloring, handwriting, cycling, dancing, and climbing. The school has a brand-new playground designed to enhance outdoor learning. St. Paul’s Plus offers an exceptional infant and toddler program where little ones are loved and nurtured by an experienced staff trained in early childhood development. Babies as young as six weeks are accepted. Infants and toddlers are cuddled and cared for in rooms especially designed for them—safe, secure, stimulating, bright, and cheerful spaces stocked with learning materials especially selected for very young children. Parents are encouraged to participate whenever possible. The St. Paul’s Lower School is a special place. Its teachers invite you to come in and see for yourself what websites and publications can only suggest. You will find a community proud of its accomplishments. You will find a community that recognizes your concerns and provides you with satisfying answers. You will find a community with sharply defined educational goals, a community that respects the needs of its most important constituency—its students. 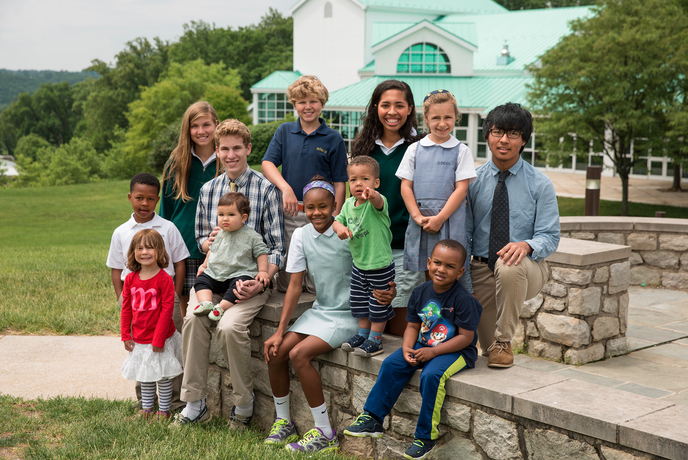 St. Paul’s challenges its students to grow intellectually, socially, physically, emotionally, and spiritually. Our teachers work closely with every single boy and girl to enable him or her to formulate and achieve goals based on individual abilities. A lifelong love of learning starts with joy. Our School is full of students finding joy in their accomplishments today, even as they are prepared to find success in the years to come. We enthusiastically welcome Lower School girls to SPSG in the fifth grade.